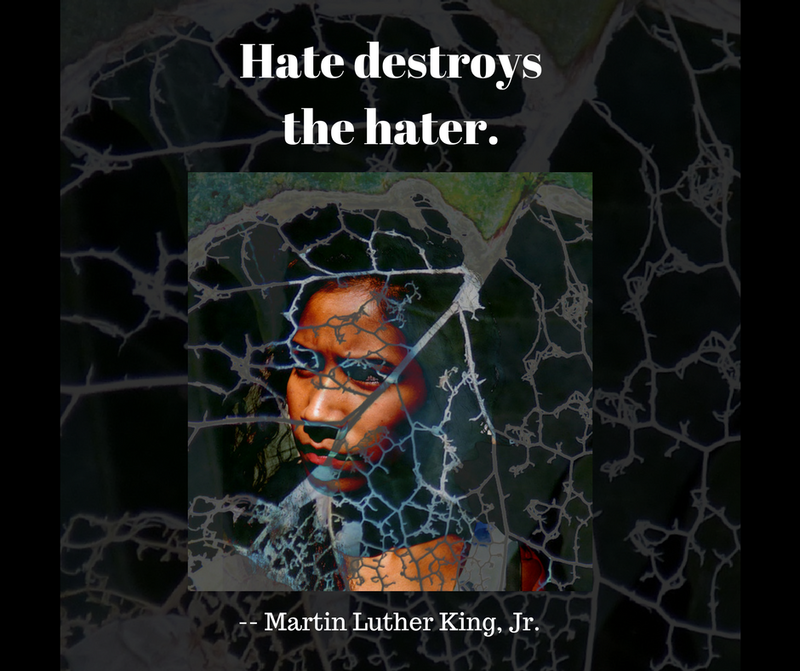 Joyce Wycoff Connecting through Art: Don’t sneeze hate … it’s contagious. As the pestilence of hate flies free from its constraints, the haters come out in force, prompting the non-haters to begin to hate the haters, thus becoming haters. I’ve been living in Ajijic, Mexico, for five months, long enough to become aware of how hard most of us try to respect the cultural and logistical differences here. Most of us are at least attempting to learn the language and revel in the colorful art, customs and history. Of course, there are those few who, knowingly or unknowingly, are rude, inconsiderate, and boorish. Facebook is a huge connector here with pages created for almost every possible interest. This week a thread was started recounting the rude behavior of a woman in a local restaurant. It was a trigger because most of us hate the thought of being an “ugly American” and when we see someone doing that, it pushes our buttons. All the pushed buttons on this page exploded into a torrent of outrage, name calling, and threatened violence. No one on this thread knew this woman. No one knew what she might be going through or what her life was like. She had obviously had a moment of rudeness. However, is she an evil, bad person or did she just do something stupid? No one knows. When the good guys become haters, what does it say about our world? The folks on this thread were the “good guys,” the people who want people to be treated with respect and kindness, and yet the hate-filled ugliness they spewed into a public forum toward an unknown woman made my head spin. I tried a mild diversion with some humor. It didn’t work. They were committed to their angry self-righteousness and, apparently, just thought I was being funny. One commenter with an Asian name expressed his sympathy for the woman. They ignored him as if he hadn’t spoken. The thread went on for the better part of a hundred comments before I dropped off, befuddled by the venom. The woman hadn’t struck anyone or damaged any property. While she was apparently rude, she hadn’t called anyone names. The response on this Facebook thread felt like a form of mob mentality. It made me wonder if hate and anger are contagious. No surprise: many other people are thinking the same thing. Time Magazine ran an article in June, 2017, titled “The Rage Flu: Why All This Anger Is Contagious and Making us Sick.” It’s an interesting article with many valid points. The one that struck me most came from a massive study that stated "anger is particularly contagious on social media.” It apparently spreads faster and more broadly than any other emotion. Hate comes from anger and fear. Could it be possible that our Facebook/Twitter expressions of outrage and all those handy little anger emojis are spreading a plague of hate? Could that be a factor in the hate we see all around us in today’s world? Maybe it’s not just the hater-in-chief that’s to blame … maybe it’s our hatred of his hatred that is spreading the hatred. It’s time to stop. Here are five actions I intend to implement immediately. Never express anger on social media. Hate is a fire … don’t feed it. Labels and name calling are like pouring gasoline on the fire. React to the action … not the person. The action may be wrong or even evil. The person, every person, is capable of good and bad. Help them see a better way. Look inside … choose kindness. Explore how and why the action is pushing your anger or hate button. Find a way to be kind. Be an example … don’t tolerate hate. Humans are social animals and peer influence creates cultural norms. Eliminate rage and hate from your own behaviors and call them out (gently and kindly) when you see them in others or on social media. Labels: Anger Flu, Contagion of Hate, social media and hate. Estoy de acuerdo, amiga. Amabilidad all the way! Yes! Thank you for expressing it so well - and for offering concrete ways to put kindness in action.